The Main Hall has 50 lines spread over a range of angles with grades from f4-f8. The focal point of the Main Hall is its 25m high leading wall, the highest in England, which sports a large roof section, overhanging jamming crack and a cave for multi-pitching. Other walls in the Main Hall range from 7m to 20m in height including gentle slabs to very steep and of course our legendary stalactite! We aim to change our routes over a 4 month cycle to keep things fresh and ensure there’s new challenges to try. 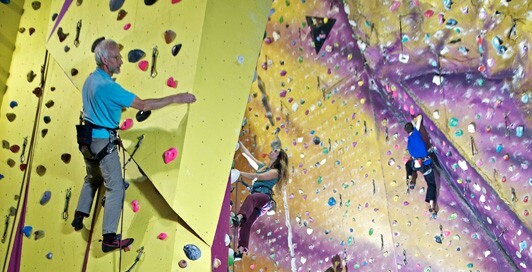 The Main Hall includes 6 autobelays and has a few top ropes but the vast majority of lines require leading skills. The main 25m wall and 20m wall are fully equipped but there’s opportunity to place your own draws on some of our shorter walls. The Chamber is our quieter leading and top roping area with the main focus of grades from F3 to F6a. This area has 17 lines up to 7m high; it is dedicated to shorter reach (for our younger climbers!) and lower grade routes but still offers interesting and challenging routes. The Den is mostly lower level bouldering and traversing, but also has three 7m high vertical top rope lines with shorter reach routes for beginners and children.